This weekend, the WSB championship visited the French circuit at Magny Cours. After another dominant series this year, Jonathan Rea was able to clinch the championship early by taking the victory in Race 1. Rea is the only rider in WSB history to win three championships in a row, which he accomplished yesterday. Filling out the podium in Race 1 were Marco Melandri (Ducati) in second and Tom Sykes (Kawasaki) in third. In Race 2, Rea suffered a DNF after Eugene Laverty’s crashed Aprilia struck the right side of his Kawasaki, forcing Rea to pit, and then retire. Race 2 was won by Chaz Davies (Ducati) with the Yamahas of Alex Lowes and Michael van der Mark finishing second and third, respectively. 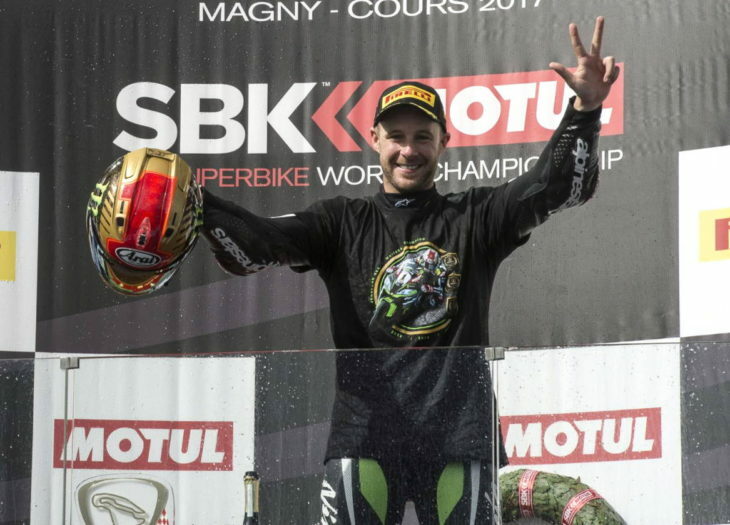 In addition to Rea’s individual crown, Kawasaki secured the Manufacturer’s title this weekend. You will find full results to Race 1 here, and Race 2 here. For additional details and points, visit the official WSB site. Although the fast guys have generally got the field handled by lap one or two of the second race, after starting back end of the top 10, the events of this race two are exactly what I most dread – the fast guys getting caught up and even injured by the mishaps of racers having little experience at the pointy end. Not taking anything away from the SBK field, they’re all blazing. But there are huge differences in the way the top three ride compared with the lower half of the top 10. I would imagine the promotors are happy with all the dicing in the first couple of laps of race two. I’m not that crazy about it, contrived as it is, and sometimes it is just plain hazardous. Would rather have seen JR demonstrate his mastery by streaking away from the field than to see him get caught up in Laverty’s mess. Others disagree, I am sure. WSB is verging on crisis and not because of the race 2 grid set up. Dwindling crowds and interest are ultimately fatal, and that’s what happens when next-to-nothing happens during a race. The organisers have to hope that next year’s technical rules compress the field. Yes, the cream will rise to the top (a la MotoGP), but it’s remarkable how MotoGP is unmissable in 2017, whereas WSB is completely forgetable. A complete turanaround in less than ten years. You’ll notice I didn’t tread on what is fatal to a racing series, not my point at all. I haven’t been to an SBK race in awhile so don’t have a particularly keen feel for how crowds and revenue have been. I’ve been watching SBK for decades, through lots of formula changes, and as long as the series gets to continue, it’s all good. So what am I wrong about again? The fact that promotors are probably happy with increased dicing in race two? My opinion that I hate to see the top racers receive the (occasionally dangerous) dis-incentive to qualify and race well of starting well back? yup PATA YAMAHA (living the dream). Ha ha, and others. For sure! Camier is my season MVP. Give the man a factory MOTOGP ride and let’s see what he can do. He’s done a few one-off MOTOGP races when he rode for Honda in which he did quite well. Time to move on when you’re this dominant. Not likely to happen though. Great rider and champion. Now, I’d like to see WSB go to unfaired naked bikes to add some interest back into the series. Every manufacturer has one and they are just as technically advanced as the Racer replicas but it would increase the difference to MotoGP. since we missed out, now to wonder if he’ll run the “golden fairings” the last 2 rounds…? oh yeah so bummed for Leo and MV Agusta’s missed podium, they’re really the story of the season. not all is lost just yet, thankfully they’ve got 4 races to make it happen.